Anyone can get reach the low hanging fruit with a bit of social media marketing. It is possible to get some results from throwing a bit of time and effort into your social media marketing. Simply setting up a Facebook page and sharing it with your friends might get you a bit of exposure and one or two new clients. The tragedy is that most businesses stop there. They typically run out of time or money to go any further. Maybe your business has reached that first peak in the graph with that first push into using media social platforms. However, as the graph indicates this typically peters off quickly. It is hard to get new clients past that initial boost. This is what a budget marketing company will do for you. They will set up your social media accounts and throw a bit of money into advertising to get you noticed. But beyond that you are out of luck. 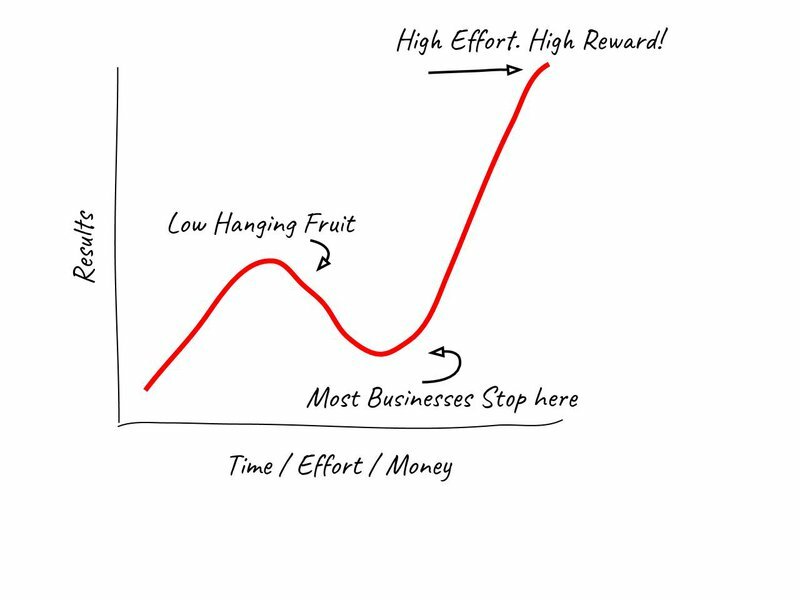 It is unlikely that you will travel up to the next part of the graph and taste the juiciest fruit at the top of that mountain. A professional marketing company will do more for you than just throw you up on social media. They will create a complete social media strategy that will give you more chance of hitting that high reward portion of the graph. They will ensure that enough time and money is being spent in the right places for your social media marketing to do work its magic. Don't get us wrong, doing a little bit of social media marketing is better than nothing. But if you want it to work to it's full potential you have to go at it full steam ahead. Hiring a professional social media marketing company will ensure that you taste that low hanging fruit but also have the potential to reach the juiciest fruit at the top. Can I use a personal Facebook profile to market my business?